The event served as a peaceful rally in response to the violence in Charlottesville, Va. last weekend after one person was killed and dozens were injured after a driver plowed into a crowd of protesters. 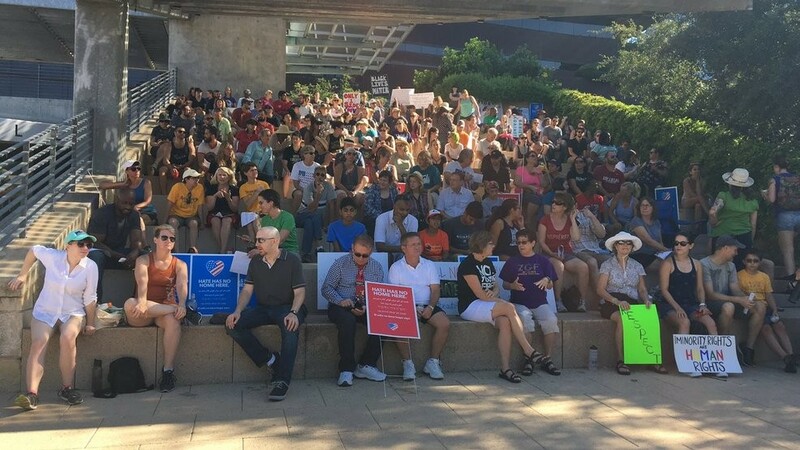 The event featured various speakers including Mayor Steve Adler, State Rep. Lloyd Doggett, Austin Community College Professor Patricia Hatcher, as well as many other community leaders and activists. “Hate never has, and hate never will make America great,” said Rep. Lloyd Doggett. Austin Mayor Steve Adler encountered his share of hecklers at the rally, but it didn’t stop him to share his thoughts of keeping the city together. “There is only one who should be carrying a torch and that’s the Statue of Liberty. In Austin Texas white supremacists will never be supreme. Let’s keep up this fight together,” said Mayor Steve Adler. Organizers say up to 1,000 people attended the event. Posted in Press Clips on August 21, 2017 by Comms.